This die cutting machines most used for large area soft material die cutting .The cutting area can from 1250mm ×500mm to 2000mm×2000mm.The cutting power or pressure from 30 tons to 500 tons. 1.Using double fuel tanks and precision four-post self auto-balancing linkage guarantees the same cutting depth of each cutting position. 2.The pressing board of cutting carries out slow cutting when it contacts the die cutter, which can make that there is no size error between the uppermost layer and lowermost layer of cut materials. 3.Precise cutting balance can effectively reduce the loss of knife mold and cutting plate. 4.The central oil supply automatic lubricating system guarantees machine precision and prolongs service life of machine. 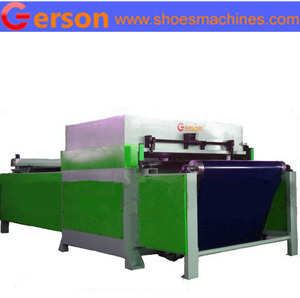 Gerson could design and manufacture according to customer production requirement.